We heard our friends talk about taking a cable car all the way up to a mountain to visit a place called Ngong Ping Village in Hong Kong. This time, my family and I experienced it ourselves. We sat in a cable car with a glass bottom and began our 3.5-mile journey to the mountain. Looking through the windows, we saw the magnificent scenery of Hong Kong. As the car continued to rise, all things became smaller and smaller, and we were like giants. When we gazed down at the bottom, we had a bird’s eye view of the mountain, and we felt like we were flying. It was an amazing experience to see God’s creation when we were up high in the air. 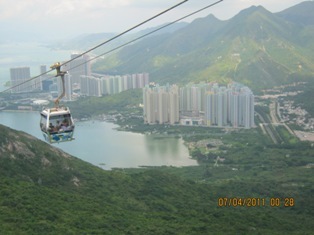 After 25 minutes, the cable car arrived at the village. 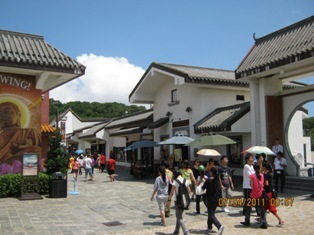 We ambled along the streets, took photos and videos, and stopped by different shops to buy souvenirs. Several hours later, we took another cable car down the mountain and ended our day at a Chinese restaurant nearby our hotel. One day, without the need of a cable car, I will rise up to the sky to meet my Savior in the air, but I will not look at the mountains or the surroundings from above because I will see the new land He has prepared for me. The old things will pass away; the new things will come. This entry was posted on Wednesday, July 27th, 2011 at 11:24 pm and is filed under Short Stories. You can follow any responses to this entry through the RSS 2.0 feed. Both comments and pings are currently closed. Amen! What a unique perspective on your cable car ride to the mountain top! What a lovely way to view the city, the village and your outlook on it. Thanks for sharing.